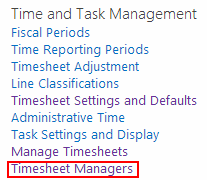 One of the new features in Project Server 2013 was to do with Timesheet Managers – i.e. those that approve timesheets. 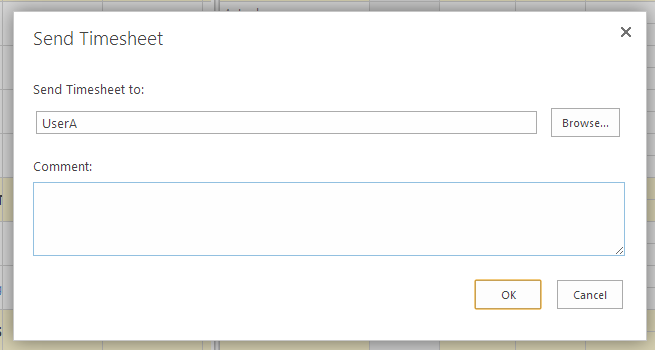 In previous versions of Project Server, this was controlled via the “Accept Timesheets” permission, but the functionality has now been split out into a new section under Server Settings (PWA Settings if you haven’t added Server Settings to the Quick Launch). 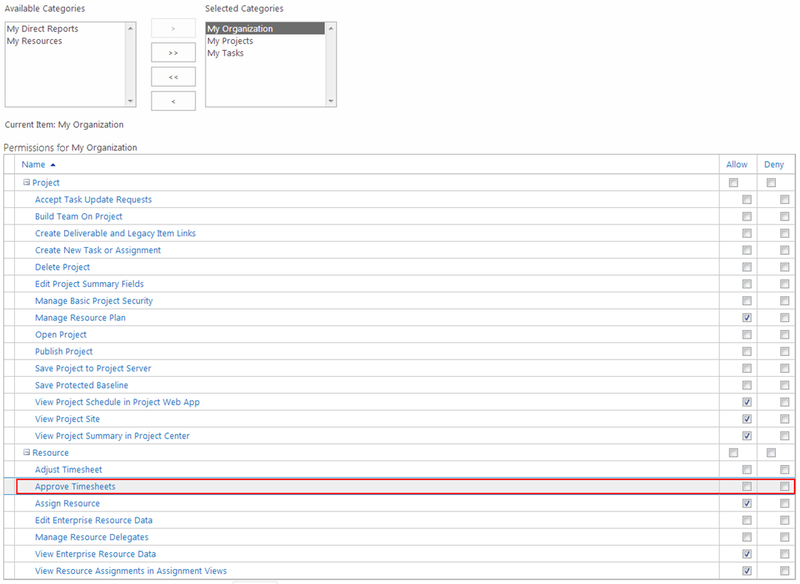 There are a couple of other permissions missing from the group permissions in 2013, but I won’t cover those in this post. There are two methods for timesheet approval within Project Server 2013 – fixed approval, which will turn timesheets in to the resource’s designated timesheet manager, or non-fixed approval, which allows the resource to choose the next approver for the timesheet. 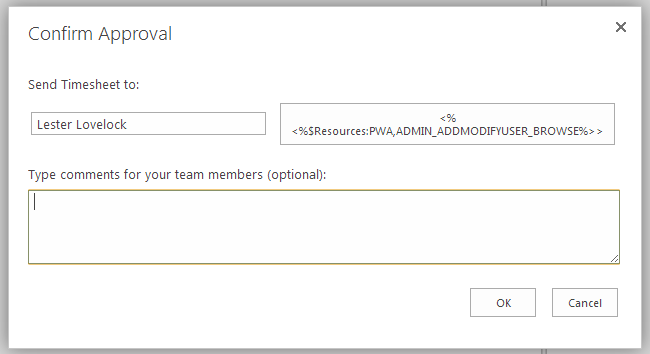 This method allows for the approval chains that were available in Project Server 2010. If you wanted to set up an approval chain so that you have, in effect, timesheet reviewers who then forward the timesheet on for approval, this is done via permissions. Because this is a category permission, you could control which groups of users’ timesheets can be approved or not. This might be useful if you wanted only a subset of resources to review timesheets for another set of resources. This could be useful for reviewing contractor timesheets, for example. Against the group that you want to have as timesheet reviewers, make sure that the ‘Approve Timesheets’ permission is NOT set for the relevant category. In my example below, this group could approve timesheets for all current and future resources (from the My Organization category). 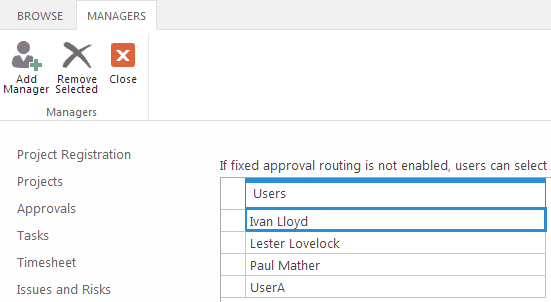 The above settings would make this group of users able to review all timesheets in Project Server, assuming they have been selected as the approver if you have not turned on fixed approval routing. Giles – great post, if a person is the timesheet manager for other resources but is not their own timesheet manager is it correct to assume that if they are permitted to approve timesheets that the timesheets they receive and approve will not go on upwards to their ownTimesheet Manager? In effect breaking multiple approvers that was possible in 2010 by virtue of Timesheet Manager definition. From my reading of this post “Fixed Approval Routing” has no bearing on this privilege. In effect I can approve timesheets submitted to me but cannot approve my own timesheet and only my submitted timesheet goes to my timesheet manager for approval.